Travelling through villages and towns, the common sights that greeted us were of fresh and inviting veggies and fruits, except of course Durian ;-) But one thing that had us absolutely drooling over was the tender coconut. What's new, don't we have that in India, you ask? Well, I'll tell you. This one is orange in colour and the the size is pretty much the same as our green ones but the water is sweeeeeeeeeet. A standard sized one holds so much water and yet has a sizeable amount of "malai" to eat at the end of the fruit. In my experience in India, if the coconut is big, the water is more but rarely ever this sweet and if you want the "malai-wala", then the water may be sweet but before you can relish you'd reach the bottom. But this one, rightly called the King coconut, is a combination of plentiful sweet water (always) and a good chunk of tasty malai in the end.We devoured one whenever and wherever we could. 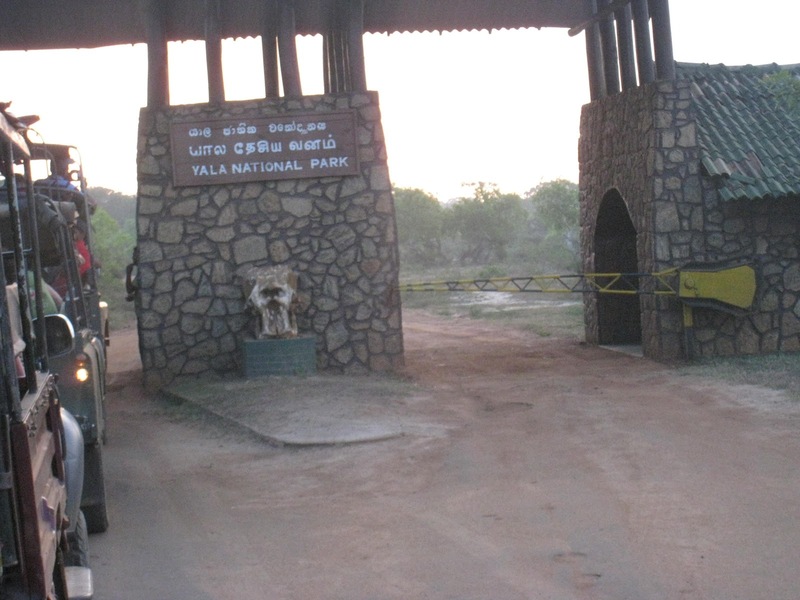 The Yala National park is one of the most visited national parks in Sri Lanka. It has about 5 blocks out of which only one or two is open to tourists. It houses elephants, wild buffaloes, leopards, sloth bears, jackals among a myriad of birds and water species like crocodiles. We left for the park in a safari jeep at around 5.30 in the morning. The dawn and dusk hours are known to be the best times to catch the animals in their natural habitat. We were damn excited about taking the safari. It was to be our first major safari. 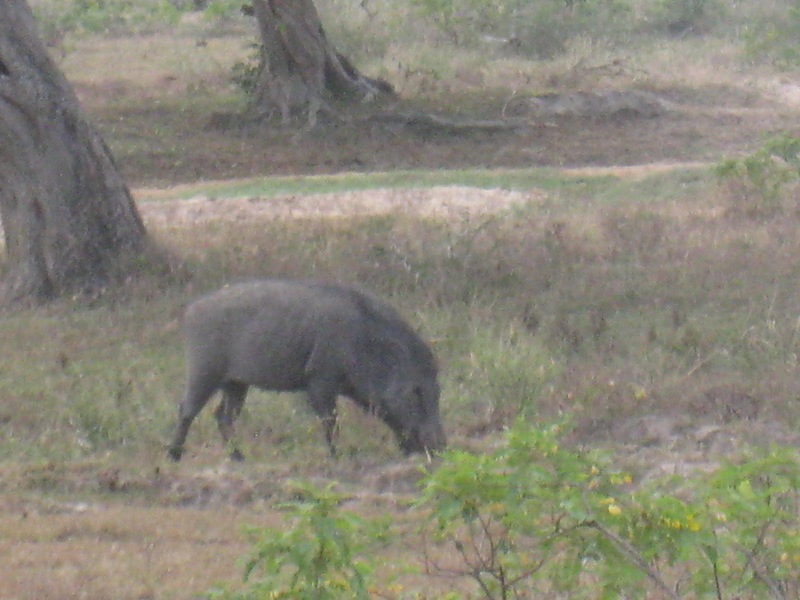 Our previous so-called safari at Jim Corbett park was a rushed affair for want of time and done mid-morning- not a good time to spot animals. 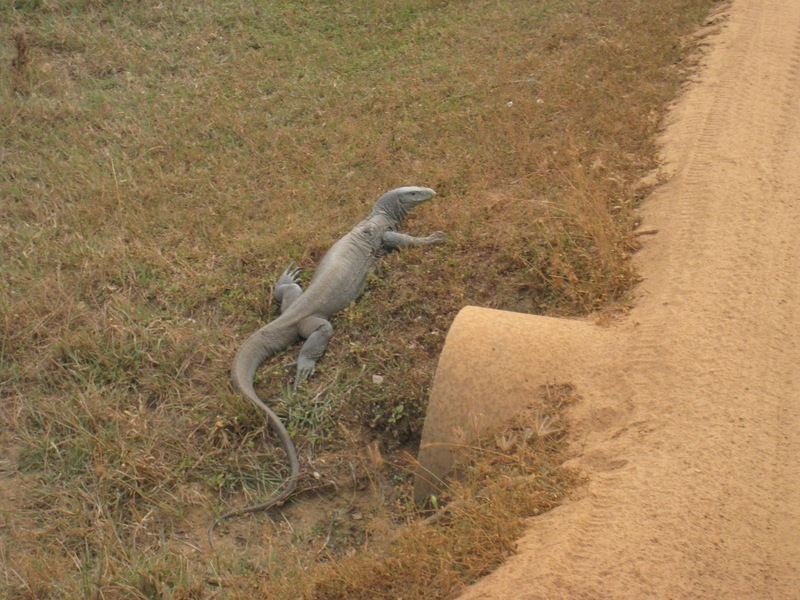 I had once taken a boat safari in Thekkady, Kerala and we didn't even see a crocodile. Again the timing was completely wrong. 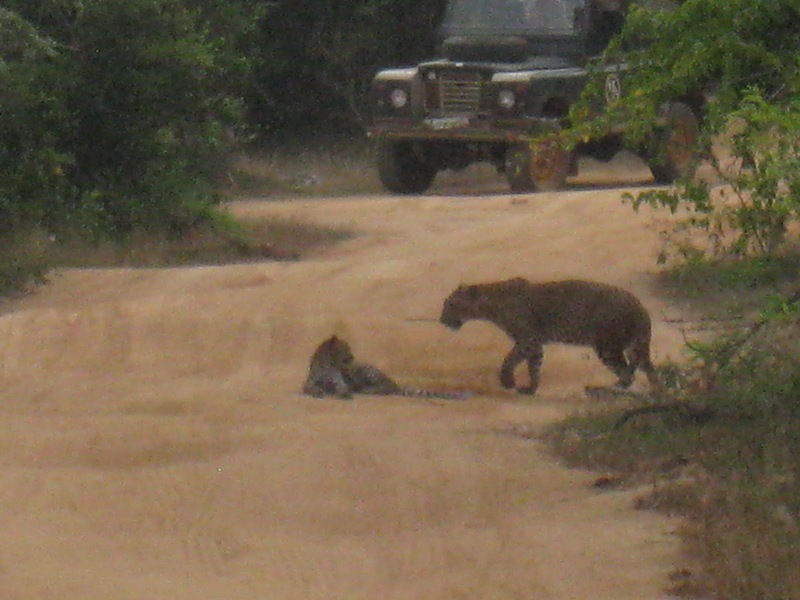 If anyone of you is going with on a package tour, ensure that the safari has at least 4-5 hours dedicated time allotted and it is either a early morning or dusk safari. 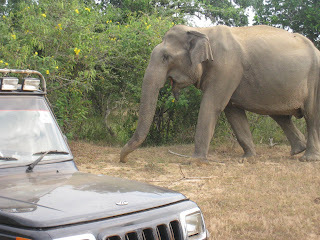 A huge tusker walked past us next, so up and close that I could just reach out my hand and pull its ears. 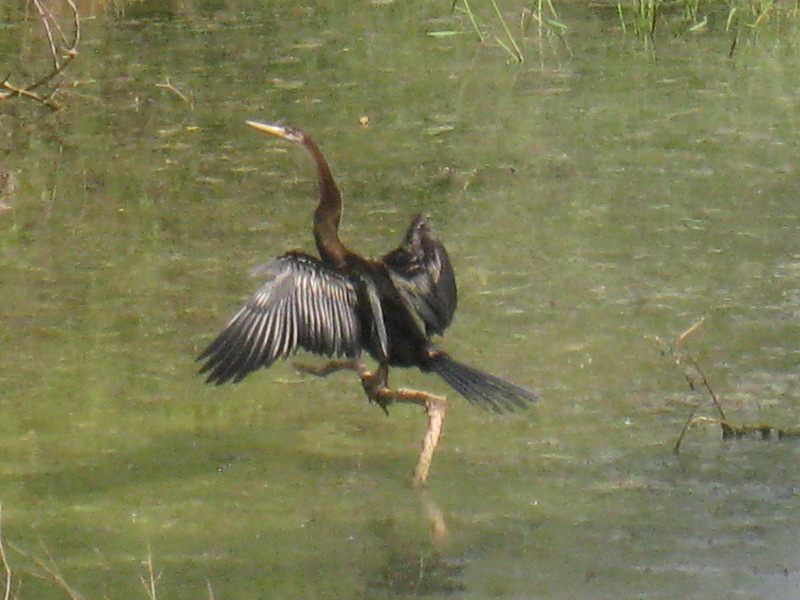 Of course I didn't or wouldn't have done anything of that sort; I was just mesmerized by its slow gait and experienced the oneness that one feels with nature in such an atmosphere. The jeep driver was a trained guy who knew the forest like the back of his hand. 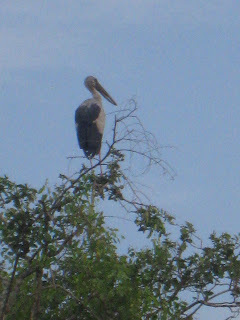 He had a trained eye too, spotting animals well hidden within the green canopies or far away near the water bodies. He provided us with binoculars at strategic points. 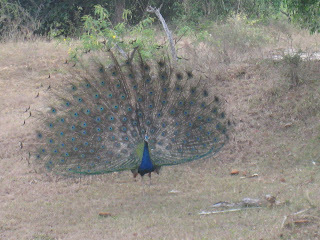 Colourful birds of various sizes greeted us near the water bodies. It's a pity, we are no bird watchers and didn't know the names of most of them except the obvious Kingfishers, cranes and some flamingo variety. A pack of jackals far, far away would have been surely missed by us had it not been for our very alert and informed jeep driver. 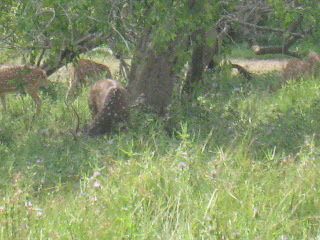 Spotted deer were abundant as were wild buffaloes. Every now and then we'd pass by fellow tourists and the drivers would exchange a one or two liners- tipping off the other of any animal that they'd have spotted on the track they were returning from. We were content just spotting just about any wild being without having any expectations of sighting the lone predator in such a huge jungle, the leopards, which also came with the tag of being "very rare to spot". 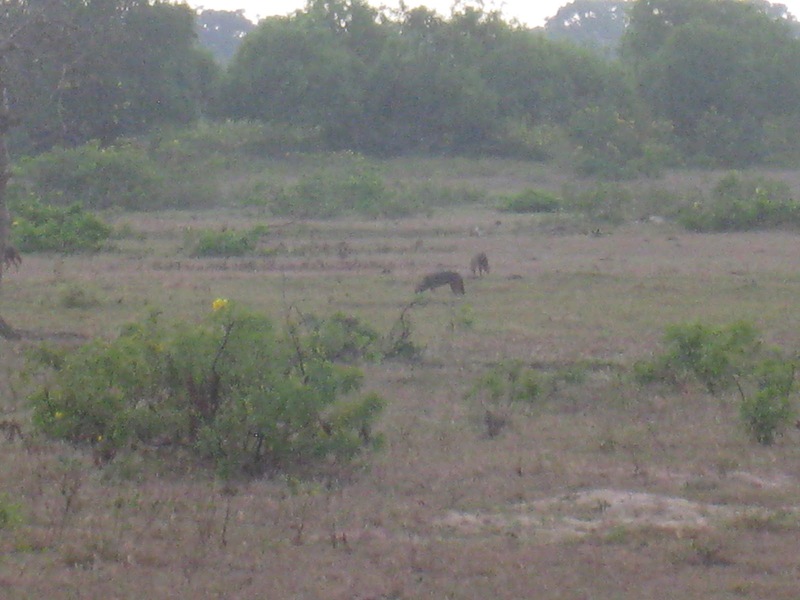 There are in all only 35 of these spotted carnivore in the park tipping the odds against sighting one easily. Little did we know the surprise that luck had planned for us. 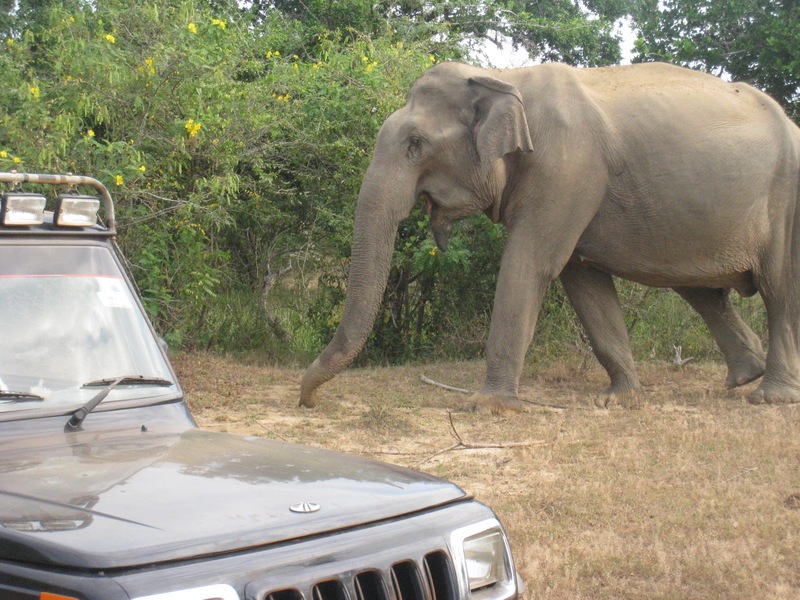 As we were returning from a particular track, the jeep came to a sudden halt and we were hushed into finding a mother-child duo right in the middle of our path as though to oblige us. We were so excited and overwhelmed to see the duo that was blissfully unaware of the effect their presence was eliciting amongst mere mortals. They spent a good 10 minutes basking in the early morning rays doing and just being at home while we took turns in clicking snaps at every possible angle. What a magnificent sight it was! The rest of the safari paled in contrast to this moment and we were just too grateful to mother nature for choosing us to be the lucky ones. 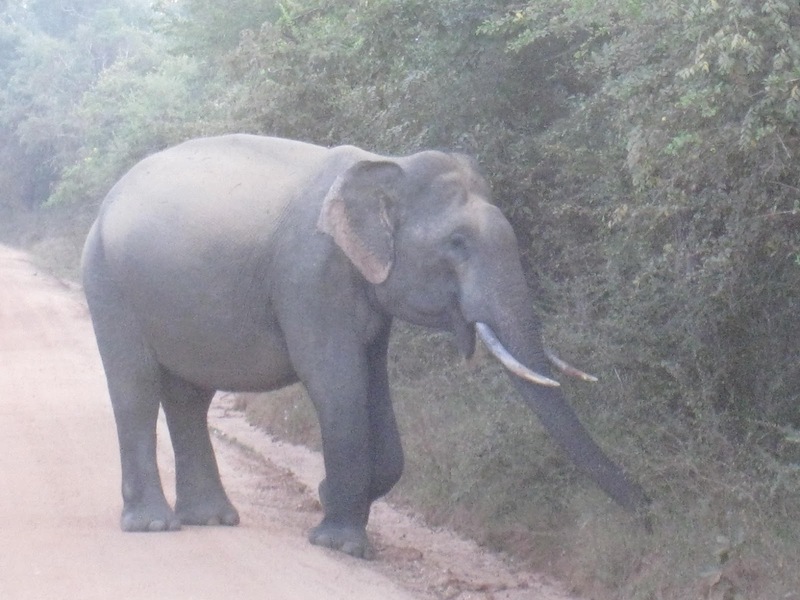 Within a span of 2 hours, we had spotted almost all the major animals that were to be found in this park, with the exception of the sloth bear, which is so rare that even our safari guide hadn't seen one in his career span of several years. We left for Unawatuna, a beach at Galle after lunch. It was again a 3.5 hour drive from Tissa. The weather had turned oppressive outside and our spirits were lifted only by the sights of crystal clear blue-green waters as we travelled along the coast. 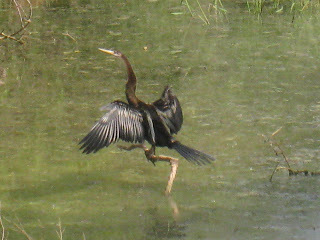 RM :-) do show the pic to R.. I agreed with you that elephant park is really looking so great. I want to go for a long vacation. 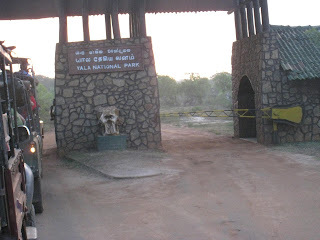 Well: If you want to go for vacation at Yala Safari in Sri Lanka with your family then you must find the great tour. All I took away from this post was - LEOPARD!!!! Can't believe you saw one...lucky you! 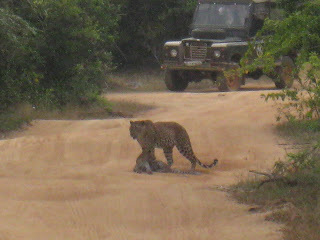 Reading this after just coming back from Kabini.. where we of course did NOT see a leopard !! Lovely pics.. and will be catching up on your older posts next :). 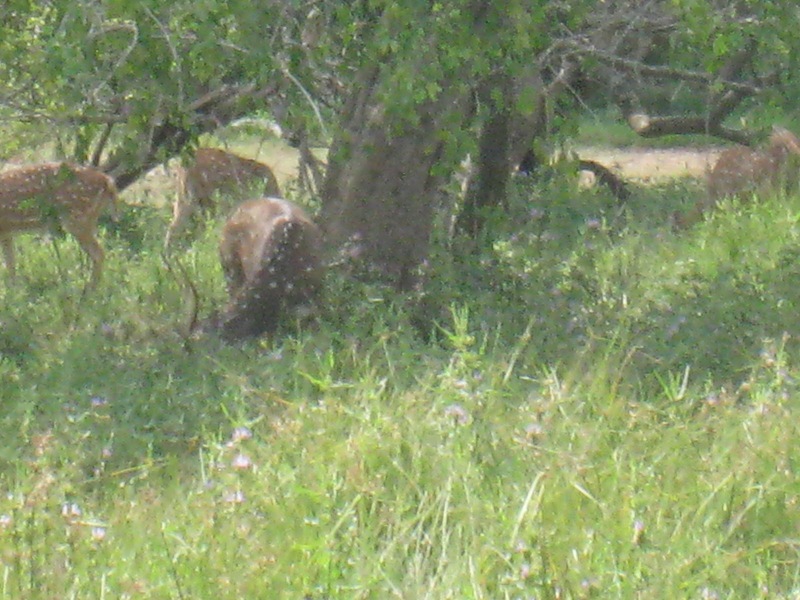 Amazing, you spotted a lot of wildlife, guess you are lucky! Agree with you, timing is very important on a jungle safari! Yes, Vibha..we got plain lucky :-) awaiting a post on your vacation now.